KEMPTON – Florence Roberta. 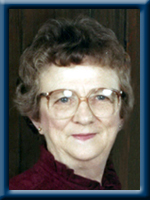 It is with sadness that we announce the passing of Florence Roberta Kempton of Liverpool on Saturday, April 12, 2014 in Queens General Hospital. She was born in Greenfield, Queens County on July 15, 1923, the eldest child of the late Carmon and Nina (Meister) Robart. As the years unfolded, Roberta became a dedicated daughter, sister, school teacher, wife, mother, home-maker and friend to all. A graduate of the Provincial Normal College, Truro, she was a highly regarded school teacher in Nova Scotia for many years; the last ten of which were in Liverpool. Her love of life and optimistic nature sent her in many directions with the helping of others being her foremost concern. The Nova Scotia Lung Association was one of the organizations of which she was a long time volunteer and received honors for her dedicated services at both the local and provincial levels. As a long time member of Gorham Chapter I.O.D.E., she was an avid worker in the group’s undertakings both locally and provincially. Her interest in crafts led to being a co-founder, co-owner and treasurer of Clay Corner Crafts which occupied twenty-five years with the pleasures of creating, producing and selling of clay products. Roberta is survived by her husband of 64 years, Harvey Minard, her sons David of Greenfield and Jamie of Waterloo. Her sisters Joyce Smeltzer of Sudbury, ON and Audrey (William) Beck of Dartmouth. Her brother Terrance (Joan) Robart of St. John, NB. Her granddaughter Krystal, grandson Benjamin and great grandson Stacy. She was predeceased by her sister Pauline Steffens, brothers Vance in infancy, John and Robert. Harvey:Sorry to hear of Robert’s passing.Sincere sympathy is extended to you and your family. Harvey,David and Jamie,sorry to hear about the loss of a wife and mother.Keep all the good times close to your heart . My condolences to the Kempton family on the passing of Roberta, such a fine lady and wonderful teacher. I had the privilege of her being my first teacher in primary. She was so well-suited to this profession and gave a good start to many of us. Mrs. Kempton was my first teacher too, in Brooklyn, and fondly remembered. My condolences to the family. Our deepest sympathy to all of Roberta’s family. She was a lovely lady and memories of her will help in the loss of her. God bless you all. Sorry to read of your loss. My prayers are with you. We were very sorry and sad to hear of Roberta’s passing.This is such a loss not only to the family but to all who knew her. She had the talent of making everyone feel at ease and comfortable when you met her.Conversations with her were always enjoyable.Please accept our heartfelt sympathy to all of you. We are sorry to hear of the lose of your wife Roberta and to Jamie and David a wonderful mother. Please accept our heartfelt sympathy to all of the family. Dear Harvey and family, we are thinking of you at this time. It was our pleasure to have know Roberta. Our sympathy is with you. Harvey ,David and Jamie We are sorry to hear of Roberta’s passing. She was a great lady ,always ready with a smile and informed conversation. Please accept our condolences. So sorry to hear of Aunt Roberta’s passing. Though I haven’t seen her in years, I remember her with great fondness. Heartfelt condolences to all. I know she will be greatly missed. I am very saddened to hear of the loss of Aunt Roberta. She was a lady that was so full of love and kindness to all who knew her. I will cherish the memories of the times spent together at the cabin when I had the opportunity to visit with you. Our heartfelt condolences go out to you, Uncle Harvey, David, Jamie and the rest of the family. She will be missed by all but never forgotten. Harvey,David & Jamie I am so sorry to hear of Roberta”s passing Harvey had told me she was in hospital on thursday when I visited and was quite concerned. My heart is with you and everyone knows what a wonderful person she was to everyone. Please accept my sincere sympathy and may God be with you at such a sad time. Rest in Peace Aunt Roberta. We will miss you and pray that God blesses the whole family as we remember you and look forward to meeting you one day in heaven. We know that you are enjoying catching up with Grammy Kempton and Grammy Shirley xo. So very sorry to hear of Roberta’s passing. Our sincere sympathy to the family. Our thoughts and prayers are with you at this time. May your memories bring you comfort. God Bless. Dear Harvey, We thank God for the privilege and pleasure of getting to know you and Roberta over the past few years. We will remember her fondly. She always had a quick, beautiful smile and a kind word to say. We will miss her. We are remembering you and your family in our prayers. May God’s comfort and peace uphold you through this difficult time. Aunt Roberta I was blessed to be able to have you in my life and you will be missed greatly. You help create many memories for our family and we were lucky to be able to share them with you. We will miss you a lot! Harvey and family – we are saddened to learn of the loss od Roberta. Our thoughts and prayers are with you at this difficult and sad time. Aunt Roberta, you were an absolute gem and we were all so lucky to have you in our lives! It was always a pleasure to visit you at the camp or see you and Uncle Harvey on your many trips to Ontario. Your kindness and love will not be forgotten and will be continued on through the family and friends you have touched along your journey. Hugs and prayers to all of the family, and especially to Uncle Harvey. We were so sorry to read of Roberta’s passing. Such a kind, gentle person. Our thoughts and prayers are with you all at this most difficult time. AND FAMILY ON THE PASSING OF A LOVELY LADY. HARD TO HEAR AND MAY ALL BLESSING BE WITH YOU. Please accept my most heartfelt sympathies for your loss. You’ve lost someone who was a special part of your family. May you find comfort in each other and in all the compassion that comes to you at this time. Roberta will be very much missed by us and all the Smeltzer families. We enjoyed visiting every time we went to Nova Scotia. Harvey, David & Jamie; you have our deepest sympathies and we will see you next time we are down. Always thinking of you two. There hasn’t been a week go by where I wasn’t reminded of the times we had at the lake and the joys that was given to us by your generosity. Harvey and the boys Our deepest and sincerest sympathies sorry for your loss. We were sad to see Roberta’s obituary in the paper. Roberta was such a lovely lady and always such a treasured cousin & friend to Mum. Please accept our sincere sympathy. Please accept our condolences at this sad time I remember,of your mom and your wife coming to visit Nina as I worked at North Queens Nursing Home and how caring she was with her mom.It seems like only a few years ago but time goes by so fast. Sorry to hear of Aunt Roberta’s passing. Aunt Roberta always took time to be with family and friends; whether at the cabin or in Liverpool. She made everyone feel welcome. God bless! We are saddened to hear of Roberta’s passing. She was a great lady and we are sure she will be missed by all who knew her. Please accept our sincerest condolences. Harvey: So sorry to hear of Roberta’s passing, she was a lovely lady to talk to. Thinking of you Love Cheryl & Jaclyn. Our deepest feelings of sorrow go to Harvey and family on the death of our beloved Roberta–our sister in law and Aunt. May we add to the many messages of sympathy to you, Harvey, and your family. Roberta had many talents, many friends, and leaves many to grieve her passing. We still have pottery bank she made for Graham many years ago, it’s ALMOST filled! We are sorry to hear of your loss. Your family will be in our thoughts during this sad time. Our sincere condolences are sent to you Harvey & family in the passing of Roberta. Thinking of you at this sad time. I am thinking of you and wish I was closer to be with you at this difficult time. Roberta was a wonderful sister to me and I cherish the time we had together over the years. I am very grateful that we were able to be together last summer and share some special moments. Roberta will be greatly missed and I hold her memory in my heart. Our heartfelt condolences are with the family at this time of sadness and loss. Roberta was a kind and giving person and greatly loved. We will keep your family in our prayers. May the Lords peace be with you all at this time. I am so sorry to hear of Roberta’s passing. You know she was very special to the all of the Bell’s. Please accept our sincere condolences. I wanted to send you a note to express my deepest sympathies. I can’t image what a difficult time you must be having. I will always remember our last visit when we had that funny cabin on the lake and Aunt Roberta drove that big Equinox that you bought. She looked so tiny behind the wheel . And of course our many meals at your cabin. It was always such a pleasure. Needless to say I wish I was closer to be of some help but I am comforted knowing you have a lot of friends and family that are there to look after you. My condolences and all my love. I think of you every day. Harvey, David and Jamie please accept our sincere sympathies your family’s loss. Our thoughts are with all of you at this time of sorrow. May you find comfort in loving memories. I’d like to offer my sincerest condolences at this difficult time. When we lose a parent, an aunt, a friend it always seems to provoke fond memories of the past. Like Dan said, I can’t help but think of our visits to the lake and the laughter of family. I will always remember Roberta as a kind and loving person. So sorry, to hear about the passing of your mom. Our thoughts and prayers are with you. Deepest Sympathy to you all. So sorry to hear of Aunt Roberta’s passing. Hold on to the good memories you have, they will help you during this difficult time. Uncle Harvey, David and Jamie, we were very sorry to hear about Aunt Roberta’s passing. She will definitely be missed by all of us and remembered as the loving person that she was. We are all so saddened at the passing of Aunt Roberta. She was an incredible, giving person and will always be fondly remembered. We are so sorry for your loss. Aunt Roberta was an exceptional person. She enjoyed life to the fullest and provided us with many happy memories which will be treasured forever. She will be dearly missed but not forgotten. Please know our thoughts are with you all during these sad times. Growing up, I always knew I could bike to the camp to have a swim or stop in to visit her in Liverpool…she was there with a smile and a cup of tea or a sweet treat. She let me “work” at her shop and showed me the fine art of wrapping a gift properly and making macrame pot holders. She will not be forgotten and she will have a special place in so many hearts. David, we are sorry to hear of your mothers passing, our thoughts are with you and your family. John and I were so very sad to hear of the passing of our dear sister-in-law. She was such a wonderful person and we had so many good times together. We are also happy that we were able to speak with her a couple of days before she passed. She will be missed by all. But I will always remember her as a very sweet lady. family. You are in my thoughts. Uncle Harvey, Our love and thoughts are with you during this difficult time. When we came to your house both you and aunt Roberta made us feel very welcome. And aunt Roberta made the best pot of baked beans we have ever had. Lots of love Stephen and Joann. Harvey and David, so sorry to hear about Roberta. You are in our prayers. We’re so sorry to hear about Roberta’s passing. Just the other day, I asked Mom if she’d like to travel to NS this September to see Roberta, Harvey, Audrey and Bill. She was delighted. I’m so happy that we did make it out there last Fall – it seems so long ago though. Roberta was such a good friend to my Mom after spending several years over the winter in Florida in the same complex. We are so blessed to have had her in all our lives. She was such a kind, open hearted, positive, and loving individual. Please know that both Roberta, Harvey, and the family are in our thoughts and prayers. My thoughts and prayers are with you all at this difficult time. We were saddened to hear of Robertas passing.She was a great,friendly soul and volunteer. She certainly will be missed.Please accept our deep and sincere sympathy. We were saddened to hear of Aunt Roberta’s passing followed very soon after by Uncle Harvey’s passing as well. I have fond memories of Aunt Roberta and Uncle Harvey, and know that they will be dearly missed. My thoughts and prayers continue to be with family and other loved ones at this time.